Having been perhaps a little negative in my review of the Römisch-Germanisches Museum in my previous post, I wanted to tell you about the other museum that I went to during my recent stay in Germany. Because this one was pretty fantastic and was a much better example of what a museum should be like. But the story of how I came to be there is a little odd, so I’ll start with that. The reason for our trip to the continent was an invitation to the wedding of Natalie’s brother, Dom, to his fiancee, Kathrin. For reasons that are still a little unclear, the pair had decided to get married in Duisburg, which is in the middle of the industrial Ruhr region of Germany. (And quite a way from where they or either sets of parents live, hence the slight confusion.) The ceremony was at midday and the reception didn’t start until the evening, so Dom and Kathrin (DomKat?) thought that they had better arrange some kind of activity for their guests in the afternoon. They decided, as you do, that what the wedding party needed was a guided tour of a museum. And not just any museum, you understand, but the Museum der Deutschen Binnenschifffahrt – the Museum of German Inland Waterway Navigation. I may come across as a little dubious here, but the museum was actually pretty amazing and I’m really glad that they took us there. The museum itself is housed in an old swimming baths, with separate pools for men and women. But rather than do away with the old decor, the people who run the museum have decided to integrate it into their exhibits – and have done so spectacularly well. And while our guide admitted readily that this was the first time in eight years working there that he’d hosted a wedding party at the museum, he took it all in his stride and quickly got into the spirit of things. 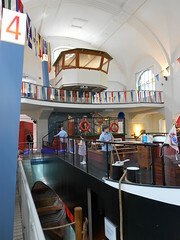 The focus of the museum is on two ships, one a genuine old sailing boat and one a slightly shortened replica of a modern day motor barge. These are berthed, in a fit of inspired genius, in the old swimming pools, which have been retained exactly as they would have been. 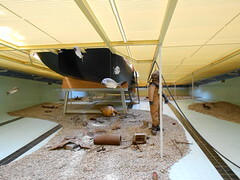 With gratings installed at what would have been water level, this means that you can wander around both above and below the waterline of the ships. In one case, they have even set up a small diving scene, with a mannequin in a diving suit and a whole load of rusted objects strewn around the ‘sea bed’. 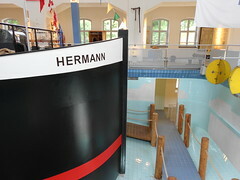 Around the edges of the swimming pools are a variety of models, artefacts and display boards highlighting other aspects of the history of Germany’s inland waterways, including historic boats and sailing ships (from dugout canoes onwards), old anchors (which we were encouraged to try to lift) and even a replica of an old sailors’ tavern. At each stage of our tour, we were encouraged to get hands-on with the exhibits, whether by looking around the replica of the modern barge, trying out the pump that would have been used to provide divers with an air supply (that’s what the thing is in the photo of the happy couple, in case you were wondering) or wheeling cargo around on an old sack-truck. Our guide even came up with a range of novel photo-opportunities for the bride and groom, including on the bridge of the freighter, mucking around with the pump (as you’ve already seen), ringing an old ship’s bell or posing alongside the majestic old sailing barge. To be honest, this isn’t the sort of museum that I would have visited if I had been in charge of the itinerary. But it would have been my loss, as the people who run the place have taken what could have been quite a dry topic and have made it into something exciting, vibrant and alive. Rather than just hearing about names, places, dates and objects that are so often seen as the key to the past, we were introduced to the people who worked on the boats and experienced in some small way what life was like for them and their families. And that, to me, is what history is all about. This entry was posted in Family, History, Travel and tagged Duisburg, Family, Germany, History, Museum, Photography, Sailing, Travel by Simon Perks. Bookmark the permalink.